Newer versions of VideoPsalm are 100% compatible with previous versions. Improved performances (startup time in 7 seconds instead of 20). Display of both Bible names in bilingual display. Screen ratio band color is now configurable (white by default). PowerPoint thumbnail width is now configurable. Freeze/unfreeze button works as expected. It is now possible to open VideoPsalm by double-clicking an agenda file. Font styles are back (they were missing since 1.20). Better Right-to-left language support (Hebrew, Arabic). Automatic Right-to-Left window layout for RTL languages. Culture-specific search in lyrics and Bible verses (document language). Backgrounds are now displayed even when their transition duration is 0. Style explorer: it is again possible to reset the header and footer templates. Import from SQLite works again (for OpenLP import, etc.). Mac folder VMvare mapping should work now. A malformed image doesn't issue an exception anymore. It is again possible to add a new song while the search field contains some text. It is possible again to open an agenda by double-clicking it. It is possible again to search Bible verses by keywords. Splash screen progress bar more precise. Microsoft Windows MSI setup (no exe anymore). Faster start (up to 30 % faster). The agenda "Move up/down" buttons visibility state is properly taken from the VideoPsalm options. Some missing labels are now translatable. Restoring a backup does not fail anymore due to a used image or document. Correction of a bug that could arise depending on the analog clock settings. To prevent the BitDefender antivirus to struggle for nothing, VideoPsalm now does give an extension to temporary files. VideoPsalm now works better on high dpi monitor (for example 192 dpi). Style explorer: VideoPsalm doesn't insert  anymore when we click twice on the header or footer field dropdown. Style explorer: The header and footer field dropdown contains now all fields. Style explorer: Missing translation added. VideoPsalm now automatically reduces the text resolution when it detects that the video memory could get filled up on high resolution monitors (this doesn't happen on "normal" monitors, only on some macs having ridiculous high resolution). Possibility to add an offset to the tamil font, via CommonSettings.TopOffsetFontSizeFactor. Correction of a bug while drag & drop a web address into the agenda. Correction of not translated labels in the options. Correction of multiple bugs in the video control. Correction in the EasyWorship import. Correction in the agenda export to the Windows Clipboard, which now contains the CCLI number. Correction of what could be understood as "Out of Memory" exceptions while displaying images. Correction of a memory leak while displaying images and text. Correction in the recognition of YouTube video links. Better audio and video control size. Audio control gets now hidden properly when switching to another document. Correction of a bug when setting style attributes while on the "Base" level. Correction of a layout bug under certain circumstances. The main form gets now displayed on top of already opened windows. In the "About" dialog, the version number is now visible, even if there is no internet connection. Better performance when switching to a new language. OpenLP 2.1 import (attention : it is necessary to convert your OpenLP SQLite DB from version 2. to 3 before proceeding to the import. If you don't know how to do that, feel free to send us your old OpenLP database, and we will do the import for you. 4 new skins, for a total of 50 skins. Bible wrap setting updates properly from an earlier VideoPsalm version. Video last image is now hidden when showing a new video. Up/Down agenda buttons can be made visible in the Options -> Customization. Eliminated startup error message on some PCs (SQLite Interop blabla). Missing texts are now translated (English, Spanish, Portuguese, French, German, Czech, Dutch, Afrikaans, Lithuanian). List of new labels (for the language translation contributors). The song editor layout is no more broken on screens with high pixel density. Audio files compatibility between 1.16 and 1.18, including agenda files. Fixes the "background image bug" found in 1.15. ﻿The "Pushpin" button is ﻿again visible by default,﻿ like it was before version 1.15. Note: you can show or hide your "Pushpin" button anytime via the VideoPsalm options -> "Customization" Tab. An MP3 can get associated to a song, and played automatically during the display of the lyrics, for churches that have no musicians. Display of a live video stream in the background (live camera). Display image thumbnails in the video gallery, like what is already available in the image gallery. Search / filtering of images and videos by keywords in their file name and metadata. This function makes it easy to find a picture or a video. Optionally optimized for touch-screen devices (bigger buttons, etc. ), for example on Microsoft Surface tablet types. Display of an animated alert message, below the text, or a clock, a stopwatch and a count-down (mechanical clock only at the moment, more models will come later if people request it). New import filters from popular formats (including CCLI .usr, OSI, Wycliffe), many corrections in existing imports (EasyWorship, OpenSong, text, PowerPoint, Psalmo, OpenLyrics, etc.). Improved song search by CCLI No., songs with chords, etc. Ability to add CCLI songs (.usr) directly into the agenda, such songs will also be added automatically to a CCLI songbook for later reuse. Display of the searched properties in the songbook tree when possible: Song number, CCLI, author, composer, reference, theme, chords, etc. Transposition / Capo more visible and user-friendly. Ability to hide the bass chords. For example "C/A#" will be displayed as "C", without the "A#" (the bass). - It is now possible to hide less frequently used buttons. - It is now possible to hide the tooltips (in the settings). - Improvement: The main window panel layout will make sure that no panel will accidentally get hidden (for example during re-sizing of the main window or a screen resolution change). - Improvement: Now after the restore of a backup, the existing files are not overridden, they are renamed into .ignore files. - Improvement: While presenting, the PC won't go into sleep, nor the screen. - Improvement: Default skin: Office 2010 Blue. - Improvement: If a document happens to be missing from the VideoPsalm Online Library, VideoPsalm continues with the download of subsequent documents. Before, the download used to fail silently. - Improvement: A Bible verse songbook is created without the "Searchable" flag set by default. - Improvement: The VideoPlayerControl is moved over the horizontal splitter. - Corrected bug: Exception when copying an agenda description while the agenda contains PowerPoint files. - Corrected bug: Bible book names get rendered with a number instead of with names under certain conditions. - Corrected bug: Shortcuts failed to work under some condition. - Corrected bug: Exception raised with malformed chord (/). - Corrected bug: Exception raised with a chord alone on a line. - Corrected bug: Exception while editing lyrics with text attributes under some conditions. - Corrected bug: Video files could get deleted under some condition during the application shutdown, when assigned to the base style. - Corrected bug: Adding an agenda into an agenda didn't shift the flow-type values. - Corrected bug: Exception when displaying an agenda Bible verse of a Bible that got deleted. - Corrected bug: Exception when clicking on another Testament when there is no Bible. Bug: Assigning an image or a video to the "Base" style level displays an error message (corrected in 1.16). It is now possible to change the color and style of individual words in a slide: italic, bold, underline, strikethrough, font, size, text color, stroke color. Ability to edit song lyrics via a simplified text editor compatible with entering RTL text, for Arabic and Hebrew. Ability to adjust the brightness of background images and videos, to better highlight the text. Display of the agenda name in the title bar and in the agenda panel. The “Open agenda” menu has been improved with additional menus for slideshow, standalone videos, PowerPoint, etc. The “Open agenda” menu visually describes what happens with your texts and styles when you open an agenda. The “Save agenda” button now has a menu. Linked (bilingual) agenda items are displayed in italic and gray. It is now possible to move multiple agenda items at the same time by selecting them. Drag & drop agenda items also works towards the upper and lower limits of the Agenda: The agenda list begins to scroll automatically. Automatic display of bilingual Bibles verses when other Bible verses are displayed. The “Copy agenda” function includes the songs lyrics and Bible verses. Added a function to copy the summary of a songbook into the clipboard. It is now possible to leave the image and video galleries opened while selecting an image or a video. The size of the image and video galleries is remembered between sessions. Several quick access buttons in the ribbon Quick toolbar. New keyboard shortcuts (Enter, /*-+, right and left click, double click on the presentation screen, quick access to verses with 1-9, C). Ability to search by keywords in the VideoPsalm Online Library, to more easily find songbooks and Bibles that you need. There is also a new "Code" field, where you can search for an abbreviation. PowerPoint: Ability to use the “Next slide” button, even within a PowerPoint slide with animations. Various bug fixes in controlling PowerPoints. Ability to save an agenda file without background images, image slideshow, video background, standalone videos, PowerPoints. When moving in lists (agenda, slides), the next item is made visible as much as possible. In the options, you can configure the text editor font and some color attributes. In the options, it is possible to selectively enable notifications of new releases, new songbooks, new Bibles and new languages. Your preferences are now stored exclusively in Settings.json and CommonSettings.json files. In previous versions, some parameters were stored in the Windows folder registered for, but this caused problems under certain conditions or even caused crashes. Correction in the Psalmo import. Correction in the OpenLyrics import. To swap between the two Bible verse selection modes, click on the search button. 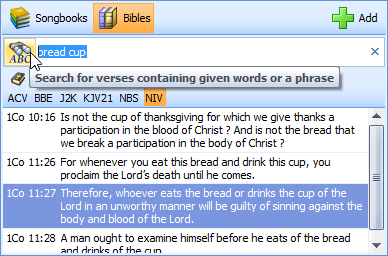 To find all Bible verses containing the words “Bread” and “Cup”, type these words in the search field. Don't be bothered about punctuation and character casing. If your language uses diacritics (accents, etc. ), don't bother about them either. VideoPsalm starts searching after you type more than three characters. The search is performed as you type. To search for a sentence, for example “Jesus took bread”, type these words together: “jesustookbread”. Here again, don't bother about the punctuation, character casing and diacritics. However, you need to type the proper orthography. In single screen mode, you can advance through the presentation by clicking on the mouse. During a search, the current slides are only replaced after you click on one of the found songs. In previous versions, the current slides were automatically replaced by the focused found song. This could be disturbing. If you copy (clone) a songbook via the Windows file explorer, it will be loaded when VideoPsalm starts. VideoPsalm assigns automatically a new id to this songbook. In previous versions, cloned songbooks were ignored. Smooth scrolling in the agenda, found Bible verses and slides grids. Bug fixes: Better handling of VideoPsalms font, better handling of horizontal splitters, to try to reduce the disappearance of the slide buttons (press simultaneously on the Ctrl + Alt + Shift keys), restore button more visible, buttons in the alert popups so that you can choose if the popup must appear the next time or not, better layout handling when you choose a bigger font in Windows, VideoPsalms settings are now stored into specific files in the respective library folders, Thai language bug correction, changing the content of the image folder doesn't crash VideoPsalm anymore, image file extensions in uppercase are now taken into account, the “Snowflake” button works again properly. Bug fix: Microsoft PowerPoint 2003, 2007, 2010 et 2013 compatibility (only 2010 et 2013 in version 1.11). Bug fix: Toolbar buttons disappearance on some PCs. Bug fix: Agenda instability (opening of an agenda containing PowerPoints, cloning agenda items via Ctrl+Drag+Drop, etc..). Bug fix: OpenSong songs import. Bug fix: EasySlides and OpenLP Bible import. Bug fix: Combined chords display after transposition via the capo. Bug fix: Search a song when a songbook has no song. Bug fix: Agenda opening set songbooks to a dirty state (no more). Two ways to edit chords: a) Chords over lyrics, b) ChordPro format. Auto-advance function: The presentation can automatically advance at a specific time interval. Agenda (song list) summary can be copied and paste in text format, for example to email a list of songs titles and numbers. Song search will find songs by number in a specific songbook, via its abbreviation. Example: "soc204" will select "Song of Fellowship" number 204. 99 Bibles in around 50 languages available in the VideoPsalm Online Library (from within VideoPsalm). Performance improvement at the loading of VideoPsalm and many bug corrections. New import filters: WebAsaph songs, EasySlides Bibles, ChordPro songs, ameliorated OpenSong import (the verse sequence is now taken into account). Slide shortcuts: 1 to 9 (and 10 with key 0) to display verse 1 to 10, C to move to the next chord, Ctrl + 1 to 9 to display corresponding chord, E to move to end of song, X to swap verse visibility (checkbox selection/deselection). When you try to duplicate a slideshow image, a video or a PowerPoint from the agenda (with Ctrl + Drag & Drop), the program raises an exception. Duplicating a song or Bible verses works like expected. VideoPsalm can only pilot PowerPoint presentations if you have PowerPoint 2010 or 2013 installed. If you have PowerPoint 2007 or 2003, you may experience unexpected results. Converting a Bible verse into a songbook song, to enable its easy edition. Keyboard shortcut: When VideoPsalm finds several songs that match the search criteria, you can add one of those songs by pressing Ctrl+song position. For example, if you want to add the third song, press Ctrl+3. Import bug correction (Bibles OpenSong, MediaShout, OpenLP, EasySlides). PowerPoint presentation control bug corrections. Better handling of the OpenSong import of songs and Bibles: verse sequence and chords are now properly imported. Header and footer fields: song title, author, composer, songbook name or abbreviation, copyright, church licence or CCLI, free text, Bible, Bible book, chapter, Bible verse, position (verse 3/5), etc. (there are many other fields). SongBook and Bible panel layout problem solved. Style explorer gets a navigation bar. Bilingual display of Bible verse gets corrected. Transition can be set with a single click (sometimes two click were needed before). Screensaver and screen power saving are now disabled during the video-projection. Removal from the backgroung image or video loop via the gallery black thumbnail. Correct handling of file names containing some special characters. The removal of a style doesn't break the program anymore. The video sound is not broadcasted twice anymore. Song verse tags are displayed with a grey color. Keyboard shortcut enabling the use of a wireless presentation device. Mouse cursor gets hidden over the presentation screen. Add videos to the agenda. Add PowerPoints to the agenda. Add slideshow pictures to the agenda (available since a long time, but mentioned here). Bilingual display of song verses and Bible verses. Ability to select whether displaying a black screen between songs. Skins : around 40 skins for different situations (low light or bright environments). Takes dynamically into account screen resolution changes, screen ratio, screen count and screen swap: it is not necessary to restart VideoPsalm for these changes to be taken into account. Ability to hide unused songbooks. Attaching font and color attributes of header and footer to the body. Chord input mode. characters automatically inserted. In this mode, it is enough to type “D” to insert [D]. Ability to switch between Chord mode: “ABC” or “Do Ré Mi” format, with automatic transposition (via the song « Capo » property). Chord font, color, size, etc. are configurable. Ribbon shortcut. Press Alt to discover them (like in MS Office). Two new search options: a) Only search in the title, b) Search song having chords. Careful : The chord format has changed: Chords use now the ChordPro format ( instead of <>). Correction in the opening of a slideshow created on another PC. Font size stored proportionaly to the screen size. No more error in case the Bible has undefined book abbreviation. No more gap in the chords display in case where the lyrics contain dashes. Transition duration now stored in ms.
Ability to define a Bible book abbreviation. Abbreviations can be useful when typing a Bible reference. Of course, it is still possible to type a reference via the book name. Red pushpin to pin the style level. Icon changes (screen instead of torch light). The displayed slide is now highlighted in blue. VideoPsalm stays on the selected slide while editing a song lyrics. 10 search methods, on the several song fields. Single click display. The double-click still works. Snowflake to freeze the presentation screen.